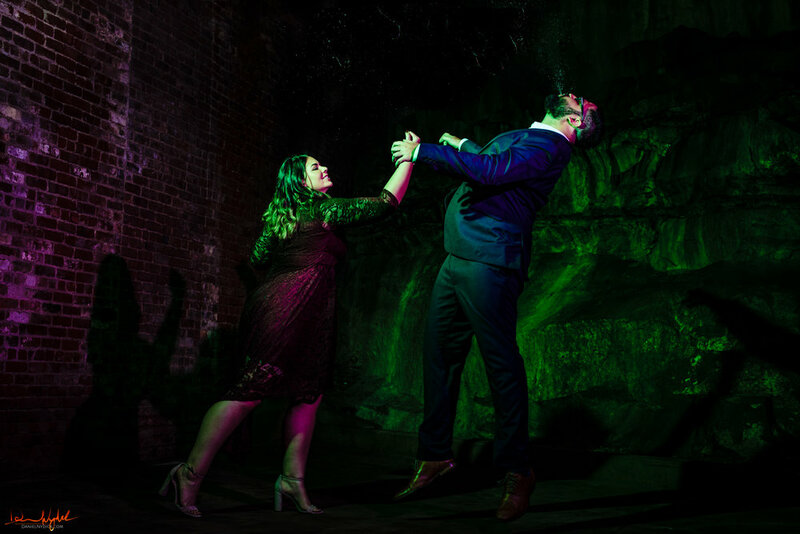 Last week I had the pleasure (and I don’t use that word lightly) of shooting the most varied and exciting engagement session I’ve had to date. Capping the night off with Ani Ramen was just a triple bonus. I have a serious yuzu obsession, and their Yuzu Lemonade and Yuzu Shio Ramen did not disappoint. I’ll hit the boring, technical stuff here. Continue past the photos to hear Jamie tell their love story in her own words. I shot this using Canon 5DMKIV cameras that were secured to me with my Holdfast Moneymaker Solo, Canon L lenses carried in my thinkTank Retrospective 10 shoulder bag, Flashpoint AD200 strobes, and a slew of Magmod modifiers and gels. Click on any image you like to see it big n’ bold! Ok Jamie; take it away! 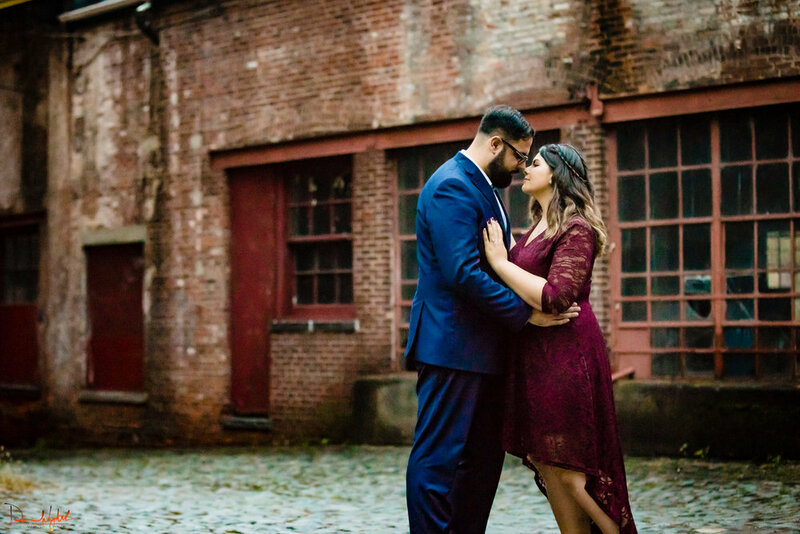 When we started planning our engagement shoot, we knew we wanted locations that weren’t the typical scenic backdrop. Although beautiful, it wouldn’t feel like “us”. We each set out to choose a location that spoke to us. As an artist, the creative energy that flows through The Art Factory made me feel completely at home. The fact that we met over art really made this spot a no brainer. Jaymes knew right away that he wanted a movie theater. We’ve watched countless movies together and you’d be hard pressed to find someone who can beat him in the movie game. He even wanted to be an actor when he was younger. When we found the Landmark Jersey Loews theater we knew immediately that was our place. The beautiful intricate details and classic feel seemed like the perfect backdrop for a fun yet striking photo shoot. Back in 2006, Jaymes and I met at Pearl Paint. As an artist, I spent a lot of time there. I’d find ways to talk to him about different types of markers or canvases, and we became fast friends. We would plan late night meet ups where I’d sneak out to meet him in his car where we’d laugh and talk until the sun came up and I’d sneak back in the house. We had lost touch for a while but reconnected and started dating in 2013. Fast forward to May 11, 2018; the day we got engaged was picture perfect. We decided to play hooky from work one Friday and take a trip to the Bronx Zoo. We both love animals and with how gorgeous it was out, we couldn’t pass up a beautiful day like that. The zoo was basically empty, all of the animals were up and active, it was a blast! It felt like we had the whole place to ourselves. My favorite part was going through the butterfly house (A couple of years ago, my grandmother passed away. We were extremely close and it was heartbreaking. Long story short, since her passing, there has been an abundance of butterfly references and significant happenings so my family and I believe that that is her way of checking in on us). We had planned on going to a friend’s birthday dinner that evening straight from the zoo so we were already dressed nicely (also to impress the lions). On the way back over the bridge, Jaymes got a phone call saying the reservations got pushed an hour so we had a little time to kill. He suggested stopping at a nearby park that had beautiful views, so we headed to Ross’ Docks to finish off our day. As we sat on the bench, he remembered he “left his keys in the car” and went to go grab them. When he came back, he pulled me to the side near the water and told me how much he loves me, and how he wants to spend his life with me. He finished his speech with “I asked your mom, your uncle, your grandpa but there was one person I couldn’t ask…” He handed me a white box and when I opened it, LIVE BUTTERFLIES flew out! I was so overwhelmed that I started crying immediately. He got down on one knee and I couldn’t speak so I just nodded and kissed him. Replaying that day in my mind it felt like a scene from a movie, it couldn’t have been more perfect and I can’t wait to continue our real life Rom-com. Ok, it’s Daniel again. I seriously cannot wait to capture Jamie & Jaymes’ wedding day’s memories at Waterloo Village next year. For now, enjoy the pre-honeymoon you two! Kelly & Mike, under the dome and on top of the world! Married at The Grand Marquis, Old Bridge NJ.